download print version January 24, 2009 marks the point at which the two STEREO spacecraft reach 90 degrees separation, a condition known as quadrature. 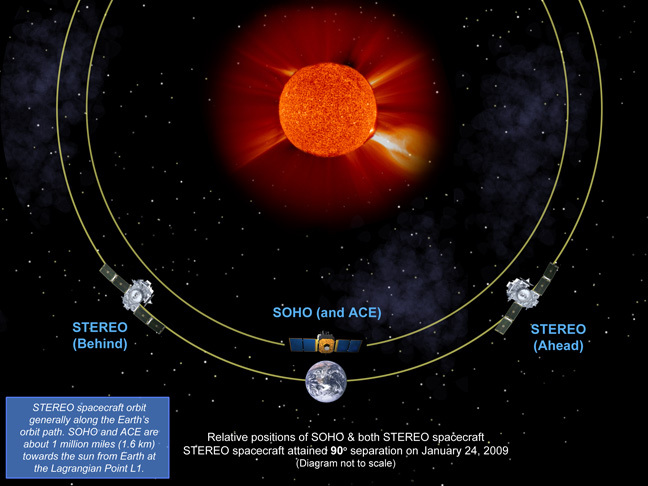 Since the two STEREO spacecraft went into orbit around the Sun at the beginning of 2007, they have been slowly drifting apart from Earth, and from each other. Ahead has been drifting at an average rate of 22 degrees per year in front of Earth, and Behind has been drifting at the same rate in the opposite direction. After two years in solar orbit, the two spacecraft have finally reached quadrature. click to view movieSuch an event happened earlier this month. 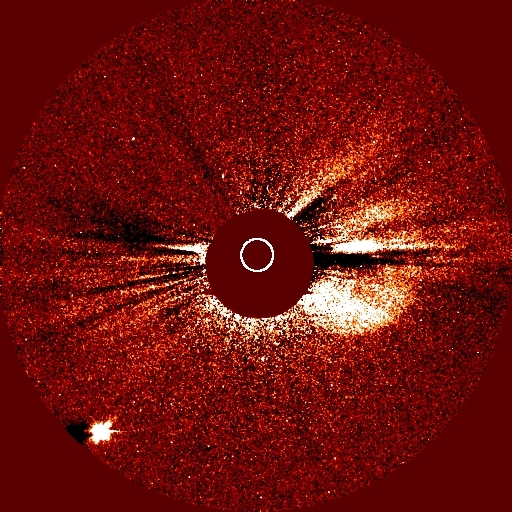 On January 8-9, 2009, a CME was observed by the SECCHI coronagraphs on STEREO Ahead. This event was seen on the left side of the Sun, which meant that it could be headed in the direction of Earth or the Behind spacecraft. On January 13, the IMPACT magnetometer on Behind detected a magnetic cloud pass by the spacecraft, a clear signature of the CME seen originating a few days earlier in the Ahead images. (Such events seen by in situ instruments are known as Interplanetary CMEs, or ICMEs.) Here we have a good example of an event seen by the telescopes of one spacecraft, and by particle and magnetic field instruments as it passes by the other spacecraft. No such ICME signature was seen by the ACE spacecraft (nor from STEREO Ahead), which tells us that the CME missed Earth--it was only observed at the position of STEREO Behind. 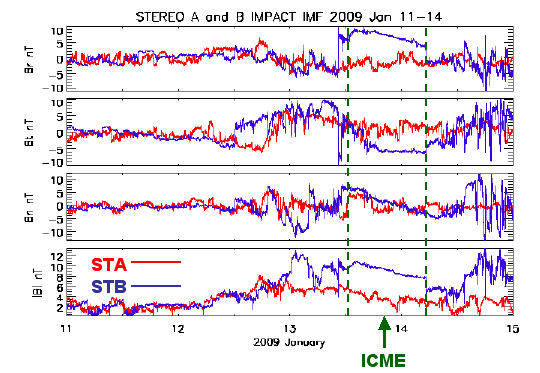 An ICME on 2009-Jan-13 was observed by STEREO-B IMPACT in-situ IMF measurements. Four panels in the graph present three components of the magnetic field and the magnitude from top to bottom. The front and rear boundaries of the STB ICME are marked with dashed green lines at ~12UT Jan 13th and ~5UT Jan 14th. The peak magnitude was ~10nT. 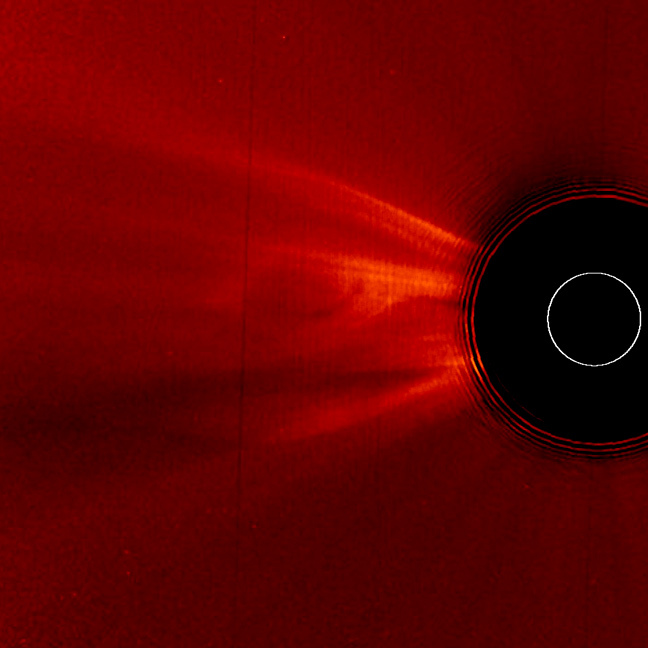 Because the CME was directed toward the Behind spacecraft, it appears fainter. However, one can make out the edge of the ejection in this more processed image formed as the difference between one image and a previous image. The bulk of material appears to be aimed at a point somewhere to the right of the STEREO Behind spacecraft. However, we know that some part of the CME material must be aimed at the Behind spacecraft, because we see it in the in situ instruments on January 13. Active regions are regions of intense magnetic field. Generated deep underneath the solar surface, they rise up to poke through the photosphere, where they form the dark sunspots seen in visible light, and the bright active regions seen in extreme-ultraviolet and X-ray telescopes. 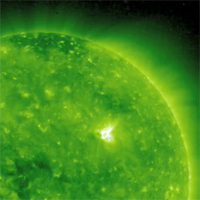 Was the emergence of this active region associated with the coronal mass ejection which happened around the same time? Perhaps, but the evidence is not conclusive. Careful analysis of the motion of the CME shows that it starts to lift off several hours before the active region emerges, so it may just be a coincidence that they appear to happen together. Or there may be a subtle relationship that we don't yet understand. One thing is certain. At least we can now ask the question with the two separate views given by the STEREO spacecraft. Only by looking from a different perspective, such as from Ahead, can one tell that this is a completely newly emerged active region. On the other hand, the coronagraph observations of the CME from Ahead do not show the details of its early history--this is much better done from Behind. It's the combination of the two views, which gives the richest data set on events like this. The coronal mass ejection of January 8-9 gives us a taste of what we expect to see in the months to come.